My name is Anbu-of-Sand. You can call me Anbu or AoS for short. I give me best to live up the my Member Title I have made up. Normally you see people post things such as 'Good card 4/5', not explaining why it's good and why it lost that extra mark, but I try to give a good impression/whatever it's called. I give great detail on cards and archetypes I review, telling the thread owner where does the card need work on. By this I hope lots of other members will start giving criticism in great detail as well. I am quite good at card making, but prefer giving CnC rather then making them. I most likely make Sets, which will be only be worked on one at a time. I will not work on more then 2 Sets at the same time, for I like my mind focused on one specific thing when it comes to card making. I will every so often make a single or so just out of boredom. I try to make all my Sets reach 10 pages and 40 cards at the end, each page having 4 new cards. All of my Sets will most likely be an Archetype of some sort which will always have a Field Spell. I am also a big fan of Chaos-based Decks. Purely because Chaos Sorcerer is my favorite card. All of my Decks are Chaos-based Decks, and all of them run Chaos Sorcerer, depending on his place on the Ban List, that will be his place in my Deck. (Yeah, that sounded kinda corny, but at least it's true). My Decks would not be the same if Chaos Sorcerer would be banned. I will not tell much about me in reality because well, that's confidential. I put up a few basic things about me on my 'Bio' though, so go check that out. And while you're at it, how 'bout a +Rep and looking at some of my sets / archetypes in my signature as well? It'd be gladly appreciated, seeing most of my Sets give out Reps for CnC on them, whether it's as constructive as mine, or just for some motivation. Click a Field Spell to go to one of my Sets! If you want me to give your Card / Archetype some critique, just message me. This is out of 2. Every OCG error I find is -.1 to your total rate, unless stated otherwise. Common Sense is when a card should be this and not that, unless stated otherwise. This is out of 4. 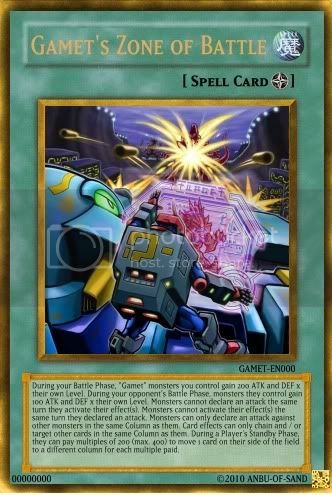 A rundown on the effect, saying how it can be used and such, and the card's uses in the current Meta and whatnot. This is out of 4. How original the card's effect, stats, etc. is, and how balanced the card is inside and out of it's effect. When I am lazy / lack the time, I pretty much just mush everything up in a paragraph.